All images expand with a click or two: all blue text is clickable too! 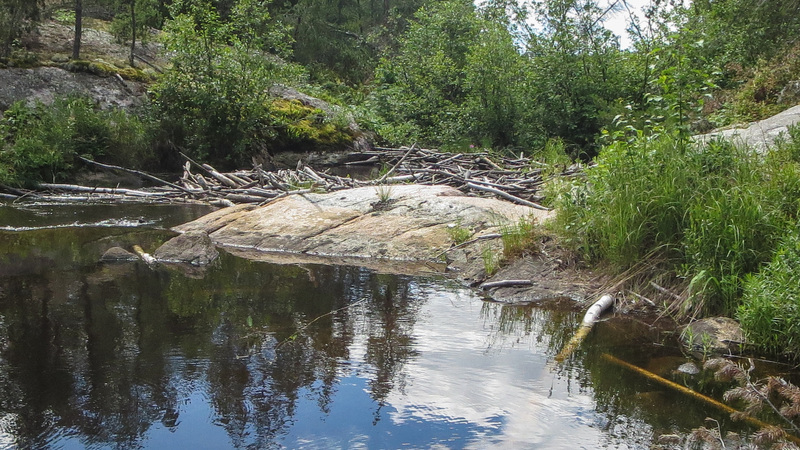 rapids/portages: seven in all, totalling about 2045 meters; also a beaver dam approaching Indian House Lake! campsites: again, scarce and average at best. We were on the water before 9:30 for what promised to be a big day. We were hoping to be at the far end of the Knox lake portage by the end of the day. 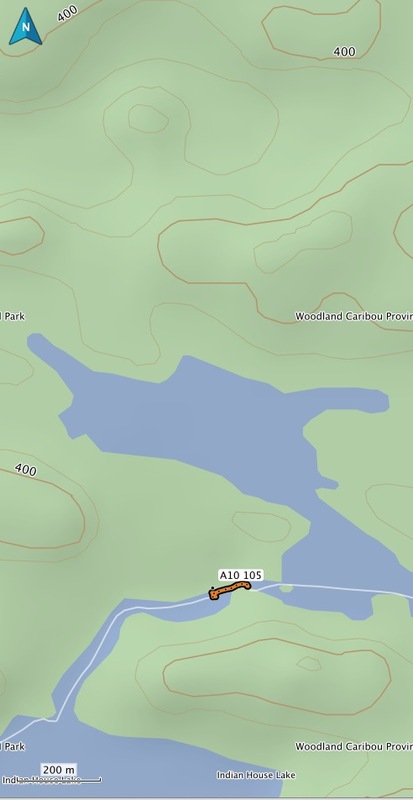 By noon we were at the A09 put in and paddling across the small lake (mistakenly labelled “Indian House Lake” on the Garmin map) and Indian House Creek into the lake itself. The pix above and below convey a little of the terrain as we approached Indian House Lake. As you can see the weather was our friend on this particular day! one stern paddler – my bro Max! Some distance up Indian House Lake on the west side of one of the string of islands that almost divides the lake in half, we pulled over and stopped for lunch. While lunch is a hurried affair for some paddlers, we actually spend an hour and even take out the butane stove to boil up some water – water for soup and water for tea or coffee. We also get the water filter out and refill the one-liter Nalgene container and then add some Gatorade. Adequate hydration is key when you’re paddling. After lunch (3:00!) we continued to the north end of Indian House and Portage A10. I was surprised to see the small creek that the portage trail comes out at was running down into Indian House and not into the nameless lake we had just portaged into. 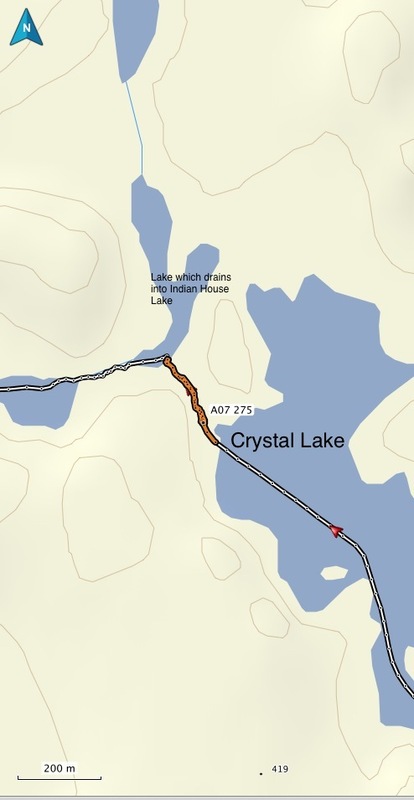 Looking at the maps that evening revealed that while Indian House Lake does indeed flow into the Bloodvein River system, it does not do so through Knox Lake. 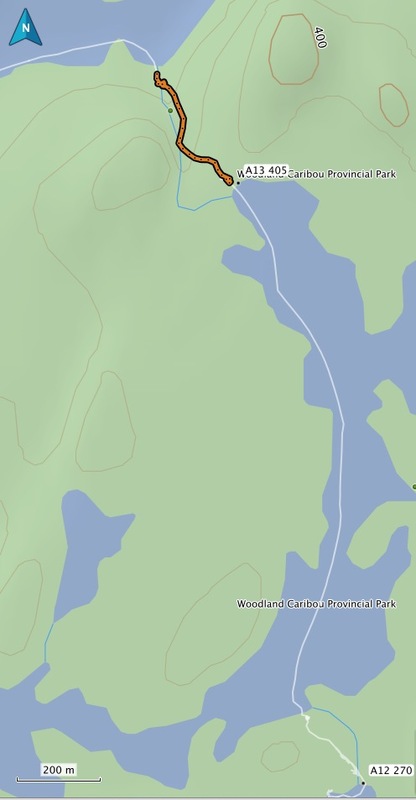 Instead, its outlet is Indian House Creek just to the west of our lunch spot which then flows down to Murdock Lake. 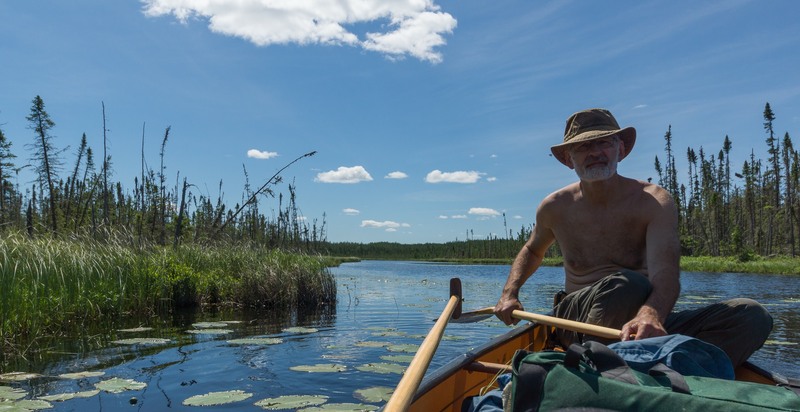 When we got past Portage A12 we briefly considered taking the time to paddle up to the very headwaters of the Bloodvein River itself – it would have meant a three-kilometer detour. In the end we agreed that we were getting a bit obsessive about doing all of the Bloodvein and figured that 99% was close enough! 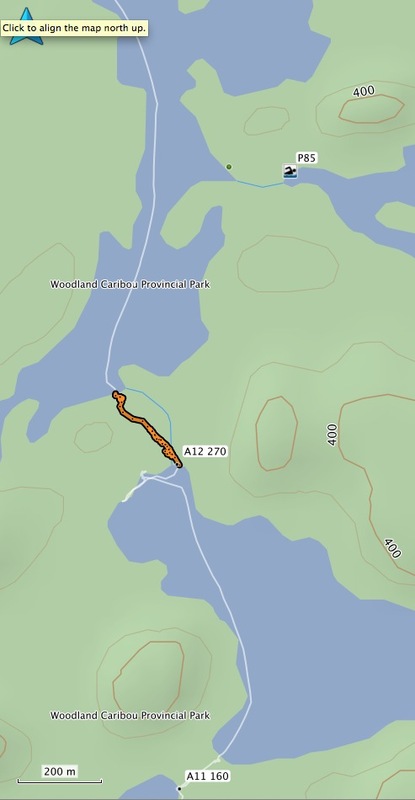 So – off to the day’s final portage (A13) . 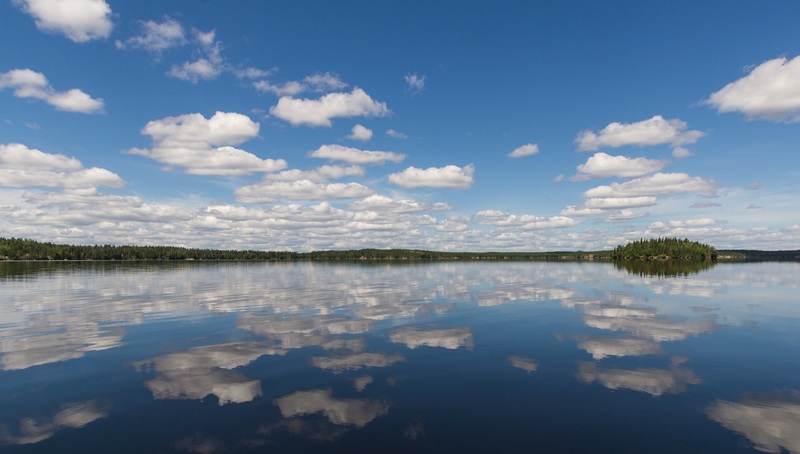 Given the aches and pains we were feeling for our first two days of paddling – but mostly from the hauling – we already knew we would not be sitting on Knox Lake at the end of this day. 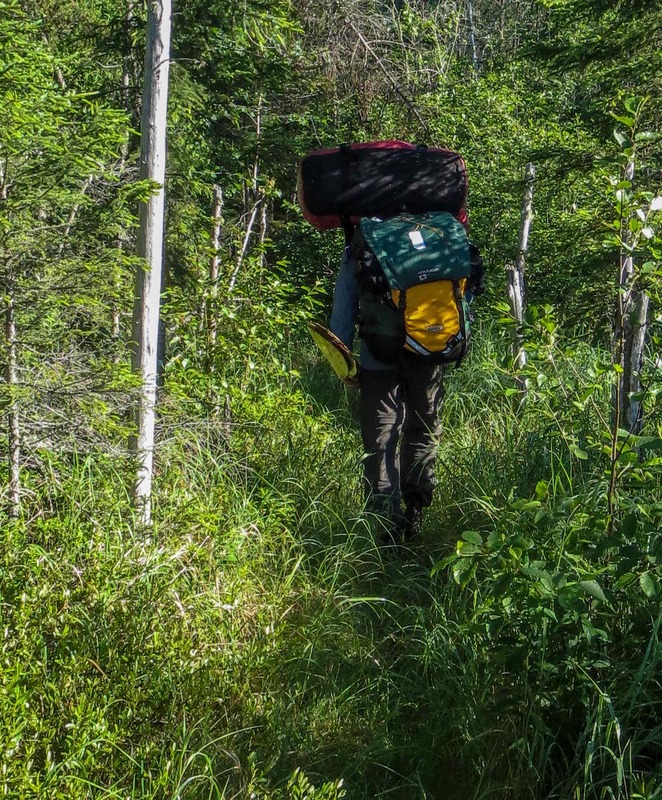 The revised goal was a campsite near the start of the portage, which we would then tackle early the next day instead of late this one. 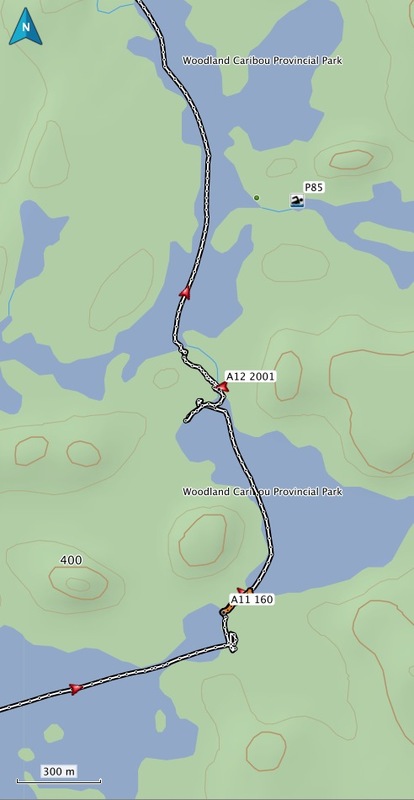 We did scout the south shore for a place to camp but, as the map below shows, we were coming up empty! 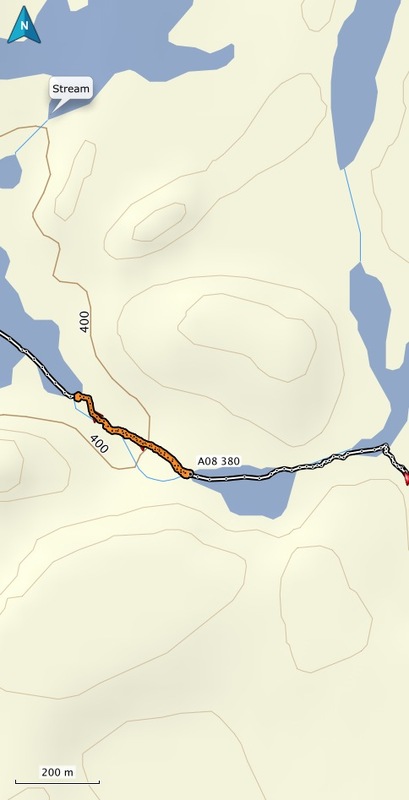 The third site we paddled by seemed to be the one we had taken from Harlan’s map at his front desk the previous morning – perhaps in our haste to get going, we didn’t get it quite right. 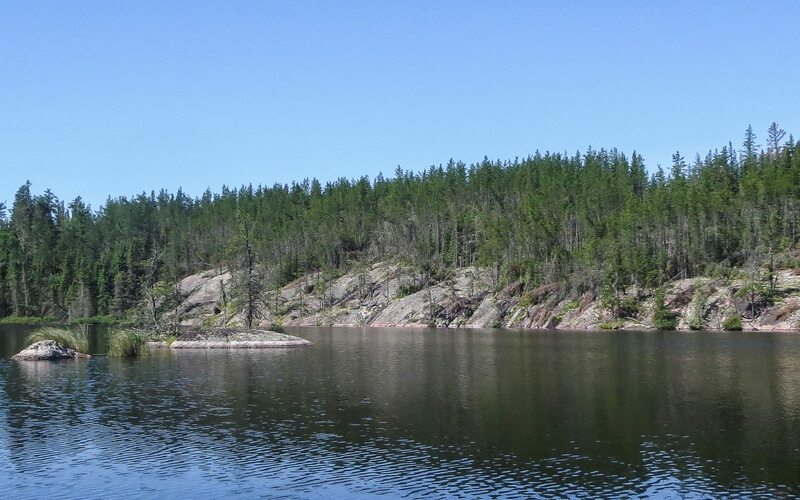 In any case, we paddled across the lake to the other shore and found a rock face backing up into some sheltering trees that did the job. The Thermarest is the great equalizer when it comes to campsites! 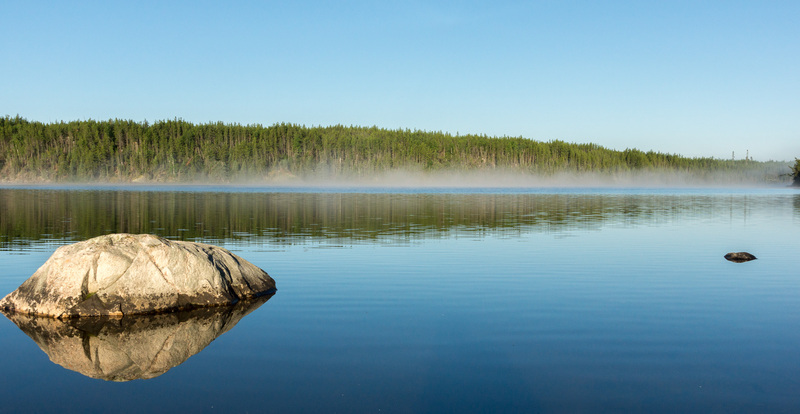 Still, neither of the first two campsites of our 17-day paddle would make the top 15 list! We were feeling some aches and pains at the end of this day. Advil time for sure! 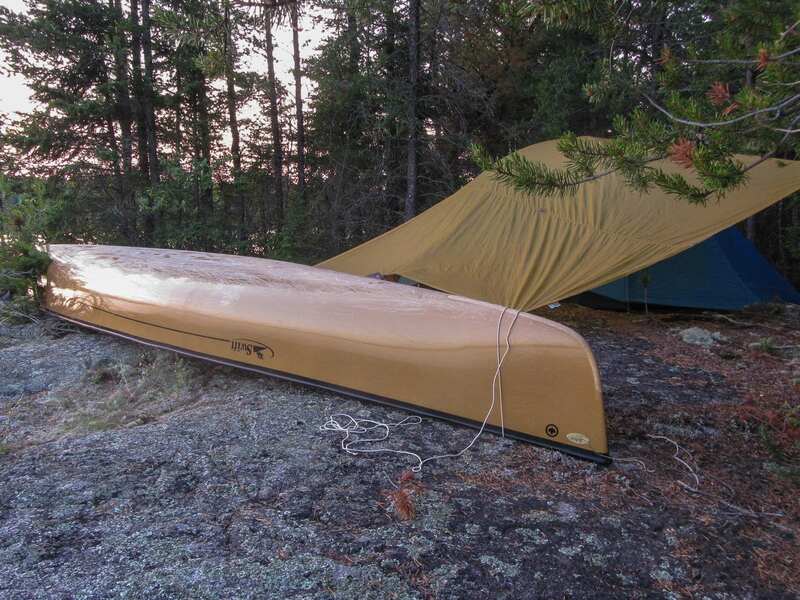 Over four kilometres of portaging and 50 kilometres of paddling in two days. However, there was just one more portage and then we would be able to say that we’d paid our entrance fee to the Bloodvein River. 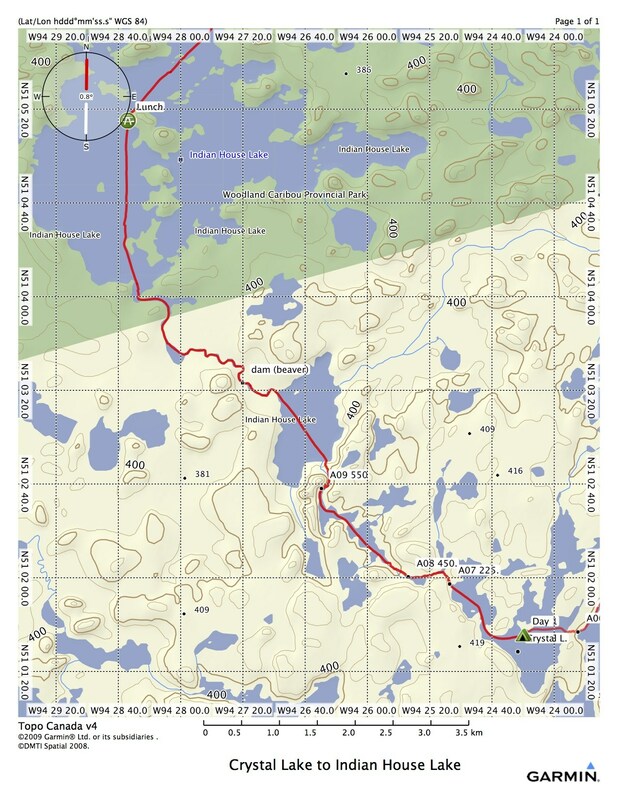 And what a last portage it would be – the 1500 meters into Knox! 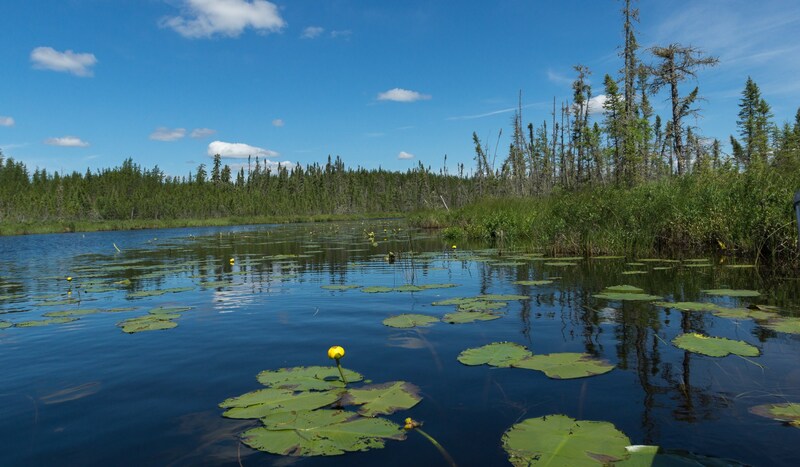 This entry was posted in wilderness canoe tripping and tagged Bloodvein headwaters, Crystal Lake canoeing, Indian House Lake WCPP, Knox Lake portage; bloodvein river canoe trip. Bookmark the permalink.